It’s never been more affordable to promote your business outdoors. Are you planning any outdoor events this summer? Going to a festival or fete? Selling your product at a fair or farmers’ markets? Sponsoring a fun run or sporting event? Get maximum exposure for your brand with low-cost outdoor displays. Our 52-page Outdoor Display Ideas Look Book has loads of ideas for this year's summer season. Download or request your printed copy today! Did you know it’s usually cheaper to hire “space only” than pay for an ugly shell scheme? 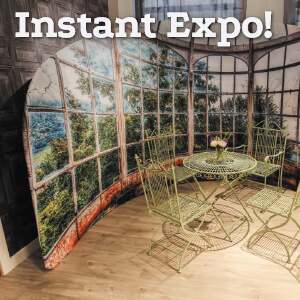 Avoid having to blu-tak posters to the wall with one of our fab new expo booths. Why advertise someone else’s brand outside your café, bar or restaurant? 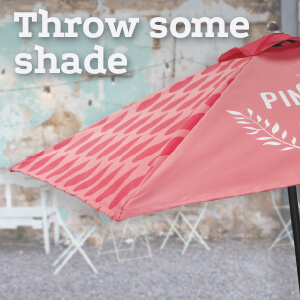 These new printed Patio Parasols can be totally personalised to suit you and your business. 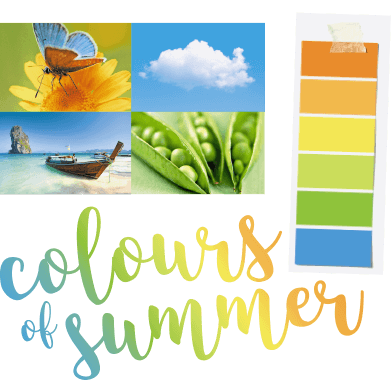 Our fresh palette for 2017 brings memories of exotic holidays and a colour scheme to blow away rainy, grey days. Ask your local printing.com to post you a free printed copy of the Look Book to browse at your leisure. Don't want to wait? You can download the PDF to your computer or smartphone (7.1 MB).